My friend Jen and I are both in love with food, so logically we would have seen the same Italian holiday special on the Food Network. It led us to the cialde at Emporio Rulli this past weekend. Emporio Rulli in Larkspur is (as of 2004, when the special was filmed) the only place in the United States where one can find these cialde, or delicate wafers. 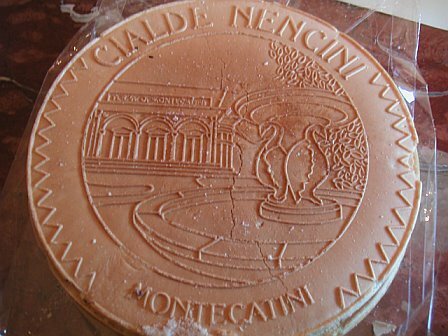 They are filled with crushed almonds and sugar, and stamped with a pastoral scene from the town of Montecatini, Tuscany, where the wafer press originates. The wafers taste faintly reminiscent of caramelized sugar and pair perfectly with coffee or espresso. Tomorrow — look out for my post on Pizzeria Picco!